Discussion in 'Gigabyte and Aorus' started by HTWingNut, Feb 16, 2014. Thin and light laptops have been largely restricted to basic low powered notebooks used for managing regular daily tasks on the web, using Microsoft Office, or consuming multimedia content. 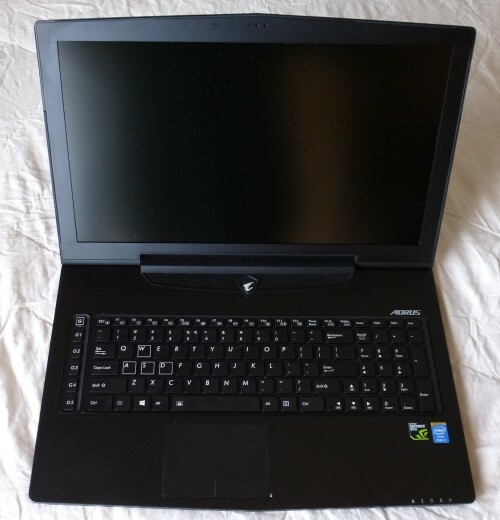 Very few are considered gaming laptops and those that are have many restrictions that make too many compromises by embedding every component, making user access to commonly upgraded components difficult or near impossible (like RAM and storage space), or thermal headroom is limited to low TDP GPU components. Aorus is trying to change all that with the x7 by using smart engineering with implimenation of SLI technology using two mid-grade GPU's to achieve similar performance to the high end mobile GPU's like the GeForce 780m, but are housed in notebooks twice as thick, a couple pounds heavier, and larger overall footprint (if comparing 17 inch notebooks). Many thanks to Aorus who provided a pre-production x7 laptop to me as a review sample so that I could share my thoughts with the NBR community. I hope this review is helpful. Aorus is a new company offering laptops and gaming peripherals, and the x7 is the first laptop in their catalog to be released. There are a few laptops that have a similar form factor, and are likely the market Aorus are trying to reach, explicitly the MSI GS70 Stealth and Razer Blade Pro. Both are sub one inch thick 17 inch notebooks with an Intel quad core embedded CPU, but house only a single GTX 765m GPU, where the x7 manages to squeeze in TWO GTX 765m GPU's in SLI configuration. Aorus claims performance about equal to a GTX 780m in most cases. This review will help substantiate that claim through evaluation of multiple gaming benchmarks and gameplay. But first, let's take a look at the specifications and features of this laptop. Aorus was kind enough to send a review sample for a few days. The system is already available in Taiwan and soon to be released in the USA with a starting price of $2099. The laptop being reviewed is actually the fully configured model for the Australian market, but apparently it won't vary much for the other markets. This review sample is also the highest spec'ed machine they offer at the moment. When you first see and handle the Aorus x7 its slimness is apparent. The sleek black aluminium chassis has some heft to it, and still requires two hands to manage without fear of dropping it, but it's also lighter and easier to handle than most 15 and 17 inch notebooks out there. 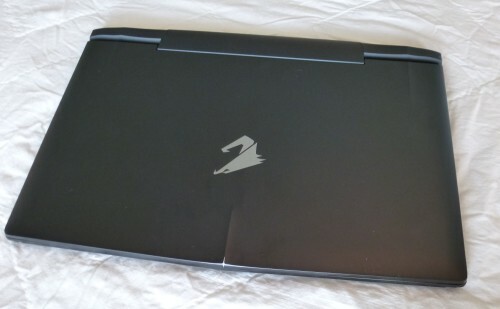 Common design cues are carried throughout the laptop from the raised ribs on the lid to the hard lines around the laptop speaker grille and Aorus logo. 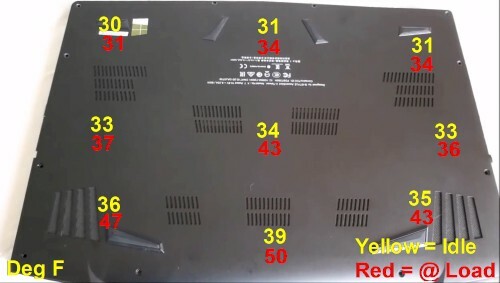 Pretty much every component is black, although the aluminum surface almost looks like a dull black or very dark gray, with almost a speckled paint look. While there are indications that this is a gaming laptop, namely the WSAD keys outlined in white, and function keys left of the keyboard, it doen't scream gaming laptops like some other brands with lots of lights and unconventional styling. The Aorus logo adorns the lid as an Aluminum decal counter sunk into the lid, and the logo is also present as the power button centered above the keyboard and in the center of the speakers there. Otherwise the laptop has a conservative styling that wouldn't stick out in a business meeting or presentation. There are an abundance of ports around the laptop and placed conveniently. On the left side from rear to front, there is a gigabit ethernet port, HDMI, VGA, USB 3.0, headphone, and mic jack. On the right side is a DisplayPort, another HDMI, two USB 3.0 ports, and a card reader. Along the front on the right are the indicator lights for Bluetooth, Wi-Fi, hard drive, batery, and power. They are just pinholes that require craning your head a bit to see if they're on if in a lit room, otherwise, clearly visible in a dark environment. On the back in the center is the power jack with two USB 2.0 ports next to it. I've found this convenient for placing your mouse USB adapter that's almost always plugged in so it's not consuming the easy access side ports. 17 inch LCD options aren't quite as plentiful as 15" or 13" notebooks, especially when choosing one for a gaming notebook, but I think Aorus picked well for their x7. This specific model comes with the matte 1080p AUO B173HW02 V1. It is TN, and while not quite the perfect screen, it has good attributes for a gaming notebook. A look at the Panelook website indicates it is a 60Hz, 72% gamut, 6-bit screen with decent brightness (300 cd/m2) and contrast (400:1), along with a respectable 8ms response. Viewing angles are typical of TN screens, so in other words not real great, but doesn't suffer from tunnel vision like the LCD on the Razer Blade 14 laptop. Gaming and movie viewing with this LCD is comfortable with no noticeable ghosting or blur. See the speaker section for video that contains sound quality and viewing angles. The keyboard is remarkably solid and so far never a missed key during typing. The chiclet key travel is small, but they're full size so it is easy and great for touch typing. They keyboard is also backlit with a white light with two intensities easily adjustable using the Fn key + Space bar or the included "Command and Control" software. One of the claims to fame of this keyboard is that it eliminates most gaming key combinations from ghosting, or in other words, not activating when three or four key combos are pressed simultaneously. While I found this to be true for most all common key combos, I did notice one combination of SHIFT+W+Z that will not activate the Z. Otherwise it is pretty solid with all the other combos typically found around the WASD layout. Of more importance is the side macro keys. Five keys labelled G1, G2, G3, G4, G5 with a single G key above it that cyles through five different lights offering a different set of commands under each light color, so 25 commands in total can be configured for macros. More on that in a moment (see software section). If there was any gripe about the keyboard, it would be that there is still a good inch of open space on either side of the keyboard which could have been utilized to separate the macro keys from the standard keys more. Also the F1, F2, etc function keys are all half height. There is room for full size keys there, it would be nice to have full size keys if the space presents itself. But that's just personal opinion and minor qualm. Where the rest of the laptop has a more or less matte appearance, the Elan touchpad has a glossy black glass finish. Multi-finger mouse gestures are supported like pinch zoom, scrolling, rotation, and three finger swipe. It is sensitive enough that you don't have to apply much pressure for control, but if you use a mouse and don't disable the touchpad, I have yet to end up with any sporadic movement or mouse jumping. I think a lot of that is a attributed to the solid base of the laptop and that the touchpad is separated from it. There are no distinct left and right buttons, although the lower right and left corners have physical buttons beneath for hard click activation. All I can say to Aorus about the speakers is ... YAY! Thank you for offering a well thought out speaker placement and using quality speakers which offer a full sound. No, it still won't compete with a dedicated speaker system, but it can get loud without distortion, offer an appreciable amount of bass, and deliver excellent music, movie, and gaming sound reproduction that doesn't sound like a tin can. You can listen to your music collection without cringing at those high notes or loss of bass. Speaker placement is at the front at each side with a subwoofer underneath the laptop. 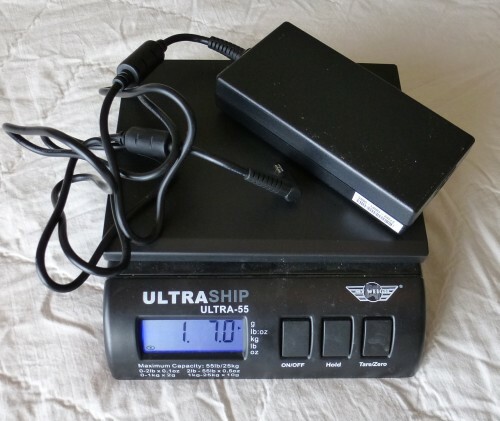 The provided power supply is 180W @ 19.5V and is quite compact for the power it provides. 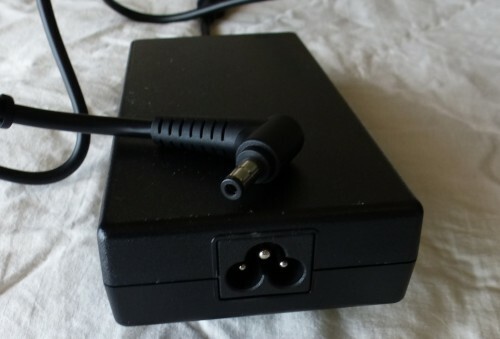 The plug to the laptop uses a round plug that is 2.5mm/5.5mm in diameter and a round 3 prong plug that goes from the PSU to the wall. 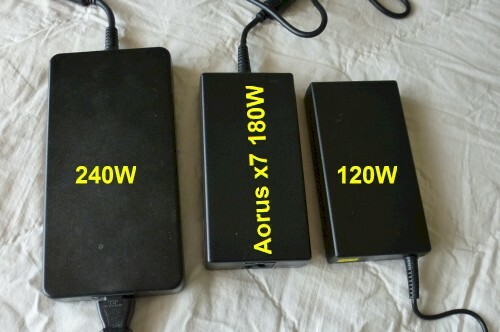 Note the size differences between a 120W, 180W, and 240W power supply shown below. Sound quality with viewing angles. Note that this was at max volume but using a point and shoot digital camera. Accessing the internal components is actually quite simple especially compared with competing slim laptops, however it is still to be seen what the warranty implications are for a user accessing and replacing the components. There is a single panel that covers the entire bottom of the laptop and is secured with twelve torx 0.5 screws around the perimeter. With the screws removed, the bottom panel lifts off effortlessly exposing the clean and well packaged layout of the interior. There are two fans and heatpipes extend along two sides of each of the fan which vent to the side and back of the laptop. The CPU shares three heatpipes with one of the two GTX 765m GPU's, and is joined with the other GTX 765m cooling with a thin copper plate adjoining the heatpipes. The second 765m basically has its own cooling fan and heatsink assembly. Based on inspection of these components, it should be quick and easy to repaste the heatsinks over the CPU and GPUs. Two mSATA slots, a 9.5mm 2.5" SATA slot, a Wi-Fi mPCIe slot, and four SoDIMM RAM slots are easily accessible as well for easy swapping of components. Only the Wi-Fi card has a ribbon cable spanning across the top, but still not difficult to access. The battery covers 2/3 of the compartment under the palmrest with the 9.5mm SATA bay consuming the rest of the space next to the battery. The sole CPU choice for the x7 is the embedded Intel i7-4700HQ 47W quad core CPU which is basically the performance and cooling equivalent of the socketed i7-4700MQ. During the benchmark testing the CPU did not throttle, with BF4 being the exception. Performance during gaming is not hindered by this CPU at all. Maximum CPU utilization rarely ever approached 50%. Twin nVidia GeForce GTX 765m GPU's provide the gaming horsepower and the two lower TDP GPU's also allow for the thinness of this laptop. The 128-bit vRAM bandwidth can still be a bit limiting in heavy AA situations, but with SLI it does allow for gaming at 1080p at high frame rates with 2x or 4x AA which any more shouldn't be required when running at native resolution anyhow. Only the most demanding games like BF4, Crysis 3, or Metro Last Light will challenge the FPS limit, but they still exceed minimum FPS of 30 for the most part, with averages much higher, around 45-50 FPS at Ultra settings. It will chew through most any other currently released game with ease at their highest settings. As with any SLI configuration, it does have some limitations, namely that the game and drivers need to support it for best utilization. With the gamut of testing performed on this test laptop, every game and benchmark resulted in 90-99% utilization of both GPU's, except for Hitman Absolution. It seems this is a common issue with Hitman and was unable to exceed 70% utilization regardless of how the profile or game was configured. Otherwise the experience has been overall excellent. A user can easily switch between using a single GPU or running SLI using nVidia Control Panel, and does not require a reboot of the PC. One other limitation is that currently nVidia Optimus technology does not support SLI which means there is no access or way to switch to the integrated GPU in the Intel CPU which more or less means diminished battery life. Granted some other brand machines with SLI or AMD CrossfireX have circumvented this by incorporating a hard switch between the SLI GPU's and the Intel GPU, but this is not the case with the x7. On the other hand, the x7 does support up to three external monitors using a combination of the four video out ports (VGA, 2xHDMI, DisplayPort). Unfortunately I do not have the monitor configuration to test this at the moment. Two SATA III mSATA slots can be utilized and support RAID 0 or RAID 1 configuration through the BIOS. This test machine came with two 128GB Lite-On M6M SSD's in a RAID 0 configuration for top performance, which is used as the boot drive. 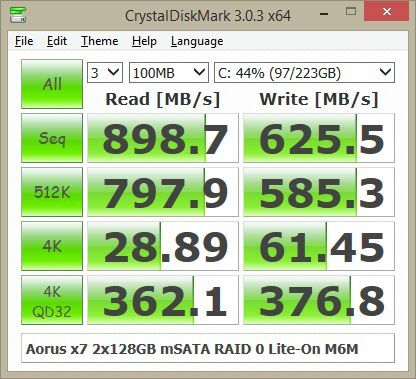 Sequential speeds are phenomenal, while 4k speeds aren't much faster than a single SSD, but this is typical of pretty much any RAID 0 Striped SSD array. Boot times are also quick, under fifteen seconds from power on until it reaches the Windows 8.1 desktop, this includes the BIOS/UEFI boot up sequence. In addition to the two mSATA slots, a full 9.5mm height 2.5" hard drive or SSD can be fitted inside the x7. This particular machine sports a 1TB Toshiba 5400RPM HDD, which offers the user the best of both worlds with a super fast boot drive and an inexpensive large capacity hard drive. Surprisingly Aorus managed to fit four SO-DIMM slots in this machine supporting up to a total of 32GB DDR3 1600MHz which is what came with this review unit. Even though Intel's website indicates 1600MHz max RAM speed, I believe technically 1866MHz RAM should be supported. It is in my personal Haswell laptop with i7-4800MQ which is architecturally equivalent to the i7-4700HQ. An Intel 7260 AC wi-fi card provides the wireless communication in this machine and performs as expected with any other machine with this card. There are two antennas connected to it, and technically any mini half height PCIe wireless card should work in this machine. The ethernet NIC is the Killer E2200. Gigabit speeds were easily maintained during file transfers over a gigabit network. Aorus earns some respect in my mind by not including any bloatware or littering the system with useless programs. Personally that is worth spending an extra hundred clams right there for this laptop. They only supply useful apps, which include a "Power Switch" panel to easily manage booting or powering the PC on or off, a "Command and Control" center for ease of configuration of commonly used system settings, "Macro Hub" which allows programming of the macro keys on the left of the keyboard, Killer NIC apps, WinDVD 10, and Aorus Driver updates and system backup tools. Windows 8.1 64-bit is the OS of choice for this machine. Below is a breakdown of each app and their intended use. I also made a brief video showing the overview of each of these apps. System Backup: It was a quick and painless process, and requires at least a 20GB USB flash drive, of which all contents will be erased when the system recovery drive is made. I used a 64GB drive and it only took less than twenty minutes to both back up and restore the system. Power Switch comes pre-installed on the destkop taskbar which offers quick access to many of Windows 8 tools relating to powering the machine on and off. From the app popup you can choose to boot into the Windows 8 Start Screen or the Desktop. This is an option added to Windows 8.1, but requires diggig into some settings to configure, so it's nice to have it readily available. 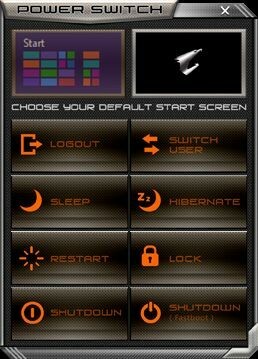 The other options are logout, switch user, sleep, hibernate, restart, lock, shutdown, or shutdown with fastboot. While some icons are just links to other system options, there are a few features which make management of Windows 8.1 a bit more bearable. I will list them in the order they appear in the control panel, left to right, and top to bottom. Fan Tweak: User fan control although limited to Stealth, Auto, and Turbo. As the names imply, Stealth favors low fan noise over temperature, Turbo sets the fan to full speed, and Auto follows the fan profile embedded in the UEFI code. LockWin Key: Toggle the Windows Key on or off. Good for times when you don't want to accidentally hit the Windows key in game and interrupt your gaming session. Mouse Speed: Provides a slider to quickly change mouse speed. Volume: Provides a slider to quickly change system audio volume. Power Mode: This one is a little more in depth, but it does allow configuration of the Windows power profiles: power saver, balance, high performance, as well as profile to automatically switch to, depending on whether on AC power or on battery. Font Setting: Switching font scaling on the desktop, choices are 100%, 125%, or a link to the display options in Windows. Programming the "G" macro keys just left of the keyboard requires use of the "MacroHub" software provided with the system. There are five colors that the master "G" key at the top of the G key column can turn indicating which macros are activated on the five G-keys. The macro recorder allows for some basic Windows controls like minimize, maximize, open, close, etc, but there is also a powerful Macro editor allowing users to control length of key presses, delay time, execute once, loop, or rapid fire mode. Having macro keys on the left have proven something to get used to, but they are close enough to your WASD hand that a macro execution is within pinky reach, so actions can be executed quickly without hunting for that specific key. Plus the color coding is also a great idea to quickly cycle through your host of macro commands. Also, it is possible to activate only one or multiple colors if you want to quickly cycles between sets of commands for certain games and not have to cycle through all five. It appears Aorus put some decent thought into the execution of their macro concept and so far has proven to be a great feature. Only thing that would make it better would be ability to launch apps (.exe, .bat files, etc) with the Macros. 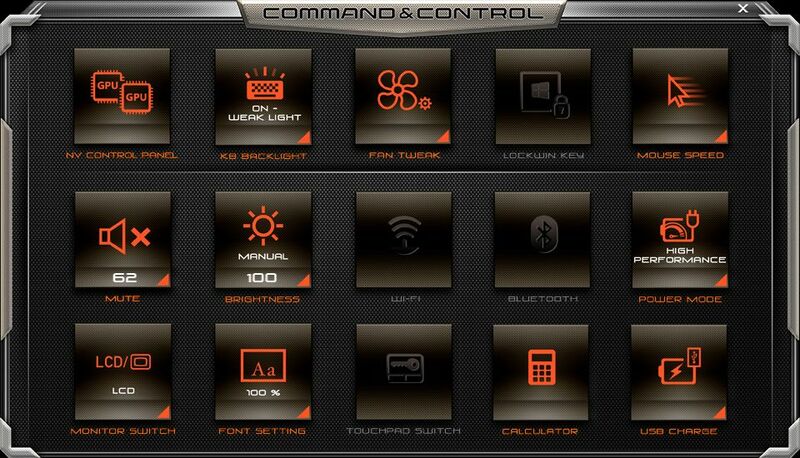 Aorus has indicated this may be added in the future. Considering the system comes equipped with a Killer NIC, the Killer Network Manager desktop app is also part of the package. Detailed networking information is at your fingertips, as well as integrated Ookla speedtest, and bandwidth control by Windows app. Considering the hardware and the fact that the Aorus x7 is marketed as a gaming laptop it isn't suprising that the battery life is not that stellar compared to what we're used to with the long life of less powerful machines or machines with Optimus. As stated previously, Optimus is not possible with an SLI configuaration, and Aorus chose not to provide a MUX to manually switch between the Intel IGP and the dedicated 765m GPU(s). Even though low power states of dedicated GPU's have improved drastically over the years, they still consume a considerable amount of power especially relative to performing basic tasks like light web browsing, note taking or watching a movie. Some of the other contributing factors include the lit power button which is always on, and does not toggle with the keybaord backlight. The LCD brightness, keyboard backlight, an increased number of hard drives or SSD's and RAM modules also can be detrimental to overall idle power consumption. At idle on power saver mode, BatteryBar Pro indicated a consumption of approximately 27-28W, and with simple math ~ 70WHr (if you consider shutdown at 5% of the 73WHr battery) / 28W ~ 2.6Hrs. I verified times by runnning each test twice and they were all within 5 minutes of each other, what is showing is the worse case time for each instance. I did get one test with wi-fi browsing that lasted three hours, but was unable to repeat that result. The integrated battery is 73WHr which is respectable, but resulting in two and a half hours of use may be a deal breaker for many. A thin and light is meant to be portable, and unfortunately users will require a frequent tether to a power outlet. If Aorus can't improve the efficency of the hardware, then hopefully there will be an option in the future for a higher density battery. Or in an ideal world, if you look at the battery arrangement, ditching the 2.5" drive bay slot would free up a lot of extra space for offering a larger battery. With mSATA drives dropping in price and increasing capacity rapidly, offering three mSATA slots if the 2.5" drive bay was eliminated wouldn't be too unreasonable IMHO, granted that would have to come in a future revision, and not sure if Aorus would be willing to ditch that laptop feature. Here is where the real meat and potatoes are at when it comes down to this laptop, gaming performance. Aorus claims it can compete with a laptop with a GTX 780m. While I do not have a 780m available to test with, I have results from a previous Clevo review, and will add the comparison where applicable. Single 765m and SLI 765m overclocked results are also compared. Regarding overclocking, like any other system, the GPU is limited to a core clock overclock of +135MHz, although vRAM is unlimited. One thing to note is that the power supply was not adequate to allow for overclocking by any amount with some of the more demanding games like Battlefield 4. However, I did utilize a 19.5V Dell (Delta) 240W power supply to see what kind of results could be obtained if one did overclock the machine. Also note that during the overclock testing, Intel XTU was utilized to drop the 3 and 4 core multiplier to 30x, which means a max boost speed of 3.0GHz, and voltage reduced by 80mV. This resulted in overall less temperature for the CPU, preventing throttling, and also opened up some thermal headroom for the GPU that shares the heatpipe/fan with the CPU. While running on battery the CPU and GPU performance is greatly diminished so gaming while unplugged will not be a pleasant experience, not to mention significantly higher battery drain. All games/tests were run at 1080p and maximum settings, except where noted. SLI configuarations can have the effect of what some refer to as "micro-stutter". Basically because both GPU's are processing and sending data to complete the frames, timing of these frames can cause some latency. This isn't entirely hardware related, moreso driver and game programming related. Some users are more sensitive to viewing the latency than others. Typically spikes in frame times result in the worse micro-stutter effect. Overall on this system, the gaming experience was smooth with no noticeable stutter. Four games were measured for frame times using FRAPS in SLI configuration: Battlefield 4, Bioshock Infinite, Dirt 3, and Tomb Raider. From the results it is apparent that it varies from game to game, which points to the effect of software and support through drivers or the game itself. Results shown are the actual frame times for each frame throughout the test, as well as the distribution of frames at the listed frame time. The tighter the band and fewer spikes result in the best overall experience. Dirt 3 exhibits a good example of what would be a good frame time experience. The average frame time is low at 12.3ms, and even with spikes ranges from about 6 to 25ms, with 85% of frames running at 10-15ms. Tomb Raider also has a tight range, but there are frequent high spikes. Frame Time Details listed in charts by expanding Spoiler tag. Managing heat is always the biggest issue with a mobile machine, and in a sub one inch laptop even moreso. The actual thickness of the base is under 3/4" thick. 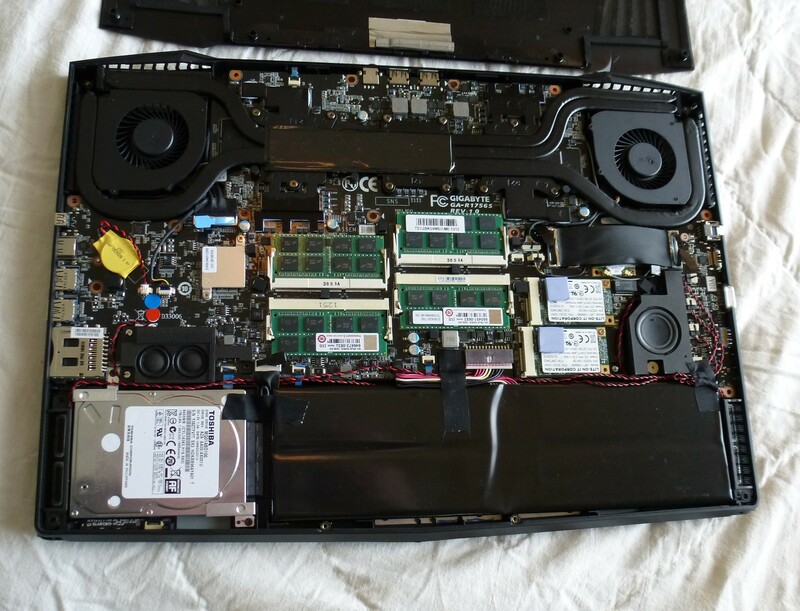 Typical laptops push the system fan air exhaust only through a single slot in the edge of the laptop. The x7 pushes air both out the side and back of the laptop encouraging improved airflow and cooling. Impressively, the 47W i7-4700HQ CPU and two GTX 765m GPU's are packaged nicely in the sleek and trim form, resulting in a gaming experience similar to a system with a GTX 780m, however, it also generates a substantial amount of heat. As noted earlier, the CPU shares cooling hardware (namely heatpipes and fan) with one of the 765m GPU's so this can have a compounding effect if both chips are being pushed hard. As designed, the laptop sits flat on some rubber bumpers that are only about a quarter inch high. This allows for decent airflow, however, it doesn't quite offer the best possible airflow. Propping the laptop up in back with just some bottle caps about a half inch (10-12mm) high resulted in lower temperatures, and even moreso running the fan at full speed, manually activated in the Aorus Command and Control app. I reran a handful of benchmarks recording temperature after propping the laptop up with bottle caps, adjusting fan speed to maximum, and with Intel XTU, setting CPU speed to 3GHz max turbo with 3 and 4 cores, and CPU voltage -80mV. The resulting temperatures were astonishingly less. As noted, if you prop up the back of the laptop and turn the fans on full turbo you drop a few degrees at load. I also went as far as using Intel XTU to drop the CPU three and four core speeds to 3.0GHz (opposed to 3.2GHz) and dropped voltage -80mV. This resulted in significantly lower temperatures, CPU temps as much as 25deg C, as seen in the temperature graphs shown below. Each of the modifications mentioned resulted in an incremental improvement in temperatures, so there is room for improvement, and even as a user, simple and easy modification to improve peak temperatures. This doesn't mean that Aorus doesn't have a little work to do IMHO. But it shows promise. Power draw results are also provided. 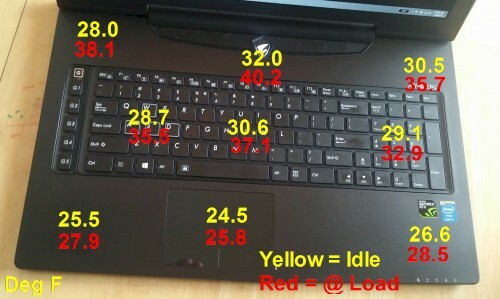 These values are the power draw from the wall, and there is a performance factor (assume ~10%) from the power supply that the laptop is actually drawing. The power supply at load did not exceed 50C on its surface, so it ran remarkably cool, however it was also stressed to its limit in many instances. With cooling, unfortunately comes noise. While idle the system was quiet with the fan only barely audible in a quiet environment. During gaming the fan sped up appropriately, and when engaging the fans at full, it was clearly audible, but didn't drown out the sound from the speakers during gaming. Below is a video showing system idle and max load temps, measured fan noise with a db meter, and measured surface temps. We are starting to see some powerful thin and light laptops emerging in the market, and Aorus has entered the race with a sonic boom. For a new company's first offering in a niche market, they have blown away the competition in raw performance and expansion options. The x7 neatly packages four RAM slots, two mSATA plus one standard SATA slot, but more impressively, two GTX 765m GPU's in it's sleek and thin form, resulting in a gaming experience similar to a system with a GTX 780m. Competing laptops of similar size and weight have thrown in only a single 128-bit GPU and have soldered RAM and/or SSD, and anything else with similar performance to the x7 are nearly twice as thick and weigh several pounds more. It is clear that this machine was designed primarily with gaming in mind, and does not feel gimmicky in any respect. Everything feels designed for practical use while gaming. The solid feel of the machine and firm keyboard along with the metal construction offer confidence in overall quality and construction. A 4k or IPS screen option would be nice, the 17" 1080p TN screen is a good match for a gaming system with 8ms response time and native 1080p resolution suited to the pixel pushing power of the system's components. The keyboard in general with the macro keys, highlighted WASD keys, and backlit keyboard are practical and useful and not overly sensationalized. Storage options won't hinder performance or capacity either, given the user has options for both fast SSD's and a large hard drive. The downfalls of this machine would have to be battery life, temperatures while gaming, and power supply. Two and a half hours of light use just doesn't cut the mustard with a thin and light laptop, regardless of how powerful the machine is. It goes against the idea of a thin and portable machine. High temperatures can be mitigated by a user through a number of easy to implement modifications like propping the laptop, using maximum fans, and more extensive measures like reducing CPU speed, CPU voltage, limiting in-game FPS, or even repasting or using an exotic thermal paste (which may likely void warranty). The temperatures don't really affect gameplay except in some severe circumstances but with a CPU exceedig 90C during regular gaming sessions is a bit of a stress on the system. Regarding the power supply, it was sufficient for the most part through gaming and the benchmarks performed, although it was reaching the power limits of the PSU, and will also limit any chance of overclocking for added performance. So is this laptop right for you? That's obviously up to you. If you're looking for a quality thin and relatively light 17 inch gaming machine and don't mind being connected to the wall regularly, this machine will deliver. For the enthusiast and performance geek, minor tweaks can be made to improve cooling and performance substantially if you don't mind "getting under the hood" so to speak. Good job Aorus. You've impressed me. steberg, win32asmguy, be77solo and 21 others like this. @HTWINGNUT Awesome, thanks so much HT, as always a great thorough review. Wow, very detailed review! I agree with you on the LCD as well, while an IPS would be nice, the 8ms response time is important for gaming and the viewing angles doesn't seem that bad either (at least not as bad as the Razor 14"). Tempting, but unfortunately the game I primarily play, Guild Wars 2, doesn't support SLI from what I can tell. Great job on this review, HTwingnut - I'm sold! It seems the primary drawback is the short battery life. Never been concerned about battery life, as I don't use my laptop for taking notes in class, etc., and these days there is always a handy AC outlet wherever I need to work. My current laptop barely lasts 1.5 hours on battery, and it has not been an issue. As for the temps, I would not plan to run games on any laptop without using a good quality laptop cooler anyways. You don't even need a laptop cooler and not sure how much it would help. But just prop it up with anything and turn fans on full, and you get a solid 8-10C drop. High resource usage games, just limit FPS to 60 and you'll drop temps even more. Then use Intel XTU if you have to to drop CPU voltage and/or multiplier. If you noticed, there was a solid 20C drop if I did all those things. Great review as always HT. While performance was impressive still wish they would have 800 series GPU's,not that the 765M's are lacking but when you spend a lot of money on a new laptop you wan't the latest and greatest. I know the early release probably had something to do with the current hardware but if had a choice to wait for new GPU's on a later release date most would be willing to hold out for another month or two. the website also lists the warranty as 2 years for everywhere including the US. if its not a typo thats a good thing in the states. The amount of sockets I see everywhere I go really makes battery life negligible, just wish there were multiple cpu's offered. I have a 2720qm and in terms of raw processing power, 4700's just not justifiable as an upgrade. Cariblo, Apr 7, 2019, in forum: What Notebook Should I Buy?